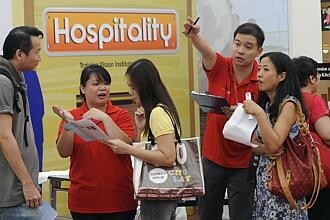 White-collared professional workers in Singapore seem to be living in a world of their own. Despite the threat of a recession hanging over their heads, 71 per cent of the 1,000-plus professionals Michael Page International polled in June were "very likely" or "quite likely" to jump ship and work for another company in the next 12 months. Unperturbed by the economic uncertainty, half of the professionals think the current job market is strong or very strong, providing them the opportunity to move, according to the recruitment firm's Employee Intentions Report. Some 41 per cent believe the job market will stay as tight as a year ago. Over a third - 36 per cent - see it improving or significantly improving in the next 12 months. The report says Singapore's job market for professionals has remained "steady" in the past 12 months, notwithstanding the shaky state of the economies in America and Europe - Singapore's biggest markets. "Multinational companies continue to invest in Singapore as a regional hub for Southeast Asia, which is driving steady demand for talented professionals across all key occupational groups," it says. The biggest chunk (41 per cent) of the professionals - especially those in procurement and supply chain - say they will change jobs for career advancement. Almost a quarter (23 per cent) will be drawn by higher pay. And how much will it take to make them switch loyalties? At least 16 per cent more in base salary, according to 35 per cent of the professionals. Most of the professionals - those under 29, in particular - will stay for a raise in salary. Being given a chance to move up the career ladder is secondary when it comes to keeping them. "One of the most effective retention strategies is to provide staff with financial rewards, and employers will need to be prepared to offer above-average salary increases to keep talent in the company," says Andrew Norton, Michael Page's regional managing director in Southeast Asia. Legal professionals are the least likely to change employers precisely because they are happy with their pay, according to the report. Others don't seem to be. Over half of the professionals polled plan to ask for a raise, with most seeking a 10-12 per cent hike in their base salary. "Sales, marketing and technology professionals are the most likely to ask their current employer for a salary increase over the next 12 months," the report says. Money matters, because keeping up with the rising cost of living is topmost in the minds of professionals in these days of high inflation. The report says if the economy gets better in the next 6-12 months, employers will be under growing pressure to hike salaries. And what if there's an economic downturn instead? Only 26 per cent of the professionals worry about that.